Posted by Judie Berger on Saturday, September 16th, 2017 at 8:20am. We are thankful that Hurricane Irma has passed, and I hope you and your loved ones are safe in the aftermath of the storm. Sarasota has dodged another one of Mother Nature’s bullets – can the ancient legends be correct? As we clean up and move forward, our thoughts and prayers are with those whose lives have been impacted by the two most recent hurricanes. It's heartwarming to see communities come together and offer support to one another during these challenging times. If you are looking for a way to help, donations can be made to a charities such as The American Red Cross and The Salvation Army. You may be wondering how the storm will impact real estate in our area. The West Coast of Florida’s beautiful beaches, culture, warm weather and easy lifestyle will always be a huge attraction. This week local real estate appraiser Don Saba had these thoughts, “What typically happens is that the market slows and stagnates in the short term and then returns as memory of the storm subsides. Sarasota has dodged storms for so long that there will be less market reaction in Sarasota than in places like Ft. Myers and especially Naples. Values in the Keys will go down tremendously as many will choose to liquidate sites after cleanup takes place while some will rebuild.” Overall, most of Florida’s real estate market will likely suffer only a short-lived impact from the hurricane. 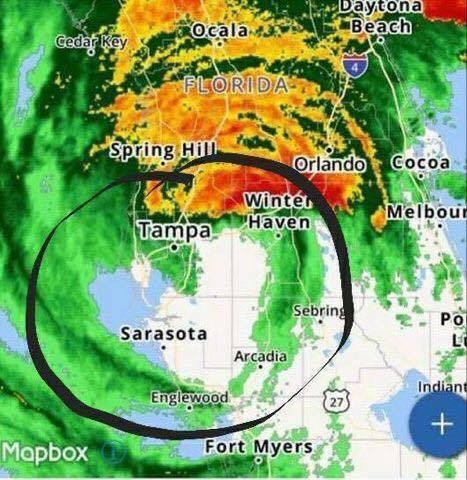 The "heart-shaped" radar image of Hurricane Irma over Sarasota. The Bottom line: Sales will remain strong. Most people interested in living in Florida accept that hurricanes are a fact of nature, like tornados and floods in other parts of the country. People still want to move to Florida, especially to the Sarasota area. For Buyers: Be realistic. Only a few sellers will panic. There will be bargain opportunities but they will be few and far between. Most sellers would rather take their home off the market and wait for things to settle down than to sell at a huge discount. For Sellers: Stay the course. If you don’t need to sell right away, just be firm in negotiations. Buyers will get the message. Do not take your home off the market. A slight reduction in Buyers in the market will be short term, and in fact, may not materialize. People want to live here. We are here to assist. Please feel free to contact me if you have any questions or concerns.